Please type your desired tags, e.g. Fibrosis, Communication Sciences and Disorders, Critical Infrastructure, Latin America, Computer Science, Bioanalytical Chemistry, Technical Writing, Supply Chain, structural dynamics, Health Policy, Motherhood & Reproduction, Romantic Relationships, Physical Anthropology, Communication, British Literature, and etc. Ray Baughman received a B.S. in Physics from Carnegie Mellon University and a Ph.D. in the Materials Science area from Harvard University. Upon graduation he went to Allied Chemical, which later became AlliedSignal and then Honeywell. 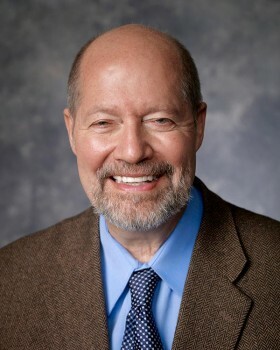 In August 2001, he became the Robert A. Welch Chair in Chemistry and Director of the Alan G. MacDiarmid NanoTech Institute at the University of Texas in Dallas. He is a member of the National Academy of Engineering, The Academy of Medicine, Engineering and Science of Texas, a Fellow of the American Physical Society and the World Innovation Foundation, an Academician of the Russian Academy of Natural Sciences, an Honorary Professor of three universities in China, and is on editorial and advisory boards of Science, Synthetic Metals, the International Journal of Nanoscience, and the Encyclopedia of Nanoscience and Nanotechnology. Ray has 66 US patents and over 300 publications with over 10,500 citations. He has received the Chemical Pioneer Award of the American Institute of Chemists (1995), the Cooperative Research Award in Polymer Science and Engineering (1996), the New Materials Innovation Prize of the Avantex International Forum for Innovative Textiles (2005), Nano 50 Awards from Nanotech Briefs Magazine for Carbon Nanotube Sheets and Yarns (2006) and for Fuel Powered Artificial Muscles (2007), the NanoVic Prize from Australia (2006), the Scientific American Magazine 50 recognitionfor outstanding technological leadership (2006), Chancellor's Entrepreneurship and Invention Award (2007), 21 for the 21st Century award (2007), the Alumni Distinguished Achievement Award of Carnegie Mellon University (2007), and the Kapitza Metal of the Russian Academy of Natural Sciences (2007). "Solid-State Fabrication, Structure, and Multifunctional Applications of Carbon Nanotube Yarns and Transparent Sheets", Northrop Grumman Lecture Series (January 8, 2007, Los Angeles, California). "From Electrical to Fuel Powered Artificial Muscles", Award Lecture for Kapitza Metal (Jan. 18, 2007, Moscow, Russia). "From Multifunctional Carbon Nanotube Tarns and Transparent Sheets to Fuel-Powered Muscles and Devices for Energy Harvesting, Storage, and Conversion", Honeywell Corporation (January 22, 2007, Morristown, New Jersey). "Strain Amplification for Artificial Muscles and Sensors Using Giant Poisson Ratios and Giant Linear Compressibilities", 2nd International Symposium on Electromaterials Science (Feb. 7-9, 2007, Wollongong, Australia). "From Electrical to Fuel Powered Artificial Muscles", Euroconference on Electronic Properties of Novel Materials (March 10-16, 2007, Kirchberg, Austria). "Autonomous Carbon Nanotube and Shape Memory Yarn, Sheet, and Wire Systems", SPIE Smart Structures and Materials Symposium (March 18-22, 2007, San Diego, CA). "Solid-State Fabrication, Structure, and Multifunctional Applications of Carbon Nanotube Yarns and Transparent Sheets", The Best Little Nano Conference in Texas (Austin, Texas, April 4-5, 2007). "Nanotechnology for Fun and Profit", Petersen Institute of NanoScience and Engineering, University of Pittsburgh (Feb 4, 2008, Pittsburgh, PA). "Diverse Carbon Nanotube Artificial Muscles Meet an Exciting New Family Member", Monash University (Feb. 21-22, 2008, Melbourne, Australia). "Diverse Carbon Nanotube Artificial Muscles Meet an Exciting New Family Member", US AFRL-Israeli Bio/Nano Workshop for Materials (March 24-25, 2008, San Francisco, CA). "Diverse Carbon Nanotube Artificial Muscles Meet an Exciting New Family Member", ChemOnTubes 08, (April 6-9, 2008, Zaragoza, Spain). "Diverse Carbon Nanotube Artificial Muscles Meet an Exciting New Family Member", Nano for Defense Applications (April 21-23, 2008, Arlington, Virginia). "Nanotechnology for Fun and Profit",Hoby Youth Leadership Conference (May 16, 2008, Dallas, TX). "Fabrication and Multifunctional Applications of Carbon Nanotube Yarns and Self-Woven Sheets", Third International Conference on Smart Materials Structures and Systems (June 8-13, 2008, Acireale, Sicily). "Solid-State Fabrication, Structure, and Multifunctional Applications of Carbon Nanotube Yarns and Transparent Sheets", Keynote Lecture, 2nd New Diamond and Nano Carbon (May 26-29, 2008, Taipei, Taiwan). "Solid-State Fabrication, Structure, and Multifunctional Applications of Carbon Nanotube Yarns and Transparent Sheets", POLYMER FIBRES 2008 (July 9-11, 2008, University of Manchester, UK). "Nanotechnology for Fun and Profit", Technology Club of Dallas (August 12, 2008, Dallas, TX). "Diverse Carbon Nanotube Artificial Muscles Meet an Exciting New Family Member", Korea Advanced Institute of Science and Technology (Sept. 4, 2008, Daejeon, South Korea). "Diverse Carbon Nanotube Artificial Muscles Meet an Exciting New Family Member", Seminar Series of Hanyang Univ. (Sept. 5, 2008, Seoul, South Korea). Bayer Polymer Engineering Lectures: "Nanotechnology for Fun and Profit" and "Diverse Carbon Nanotube Artificial Muscles Meet an Exciting New Family Member" (Sept. 18-19, 2008, Univ. of Akron). "Nanotechnology: Having Fun in Scientific Discovery and Generating New Products", Hispanic Science and Technology Program (Sept. 22, 2008, University of Texas, Pan American). "Diverse Carbon Nanotube Artificial Muscles Meet an Exciting New Family Member", NanoTX 08 (Oct. 2, 2008, Dallas, Texas). An international research team led by scientists at Beihang University in China and The University of Texas at Dallas has developed high-strength, super-tough sheets of carbon that can be inexpensively fabricated at low temperatures. The team made the sheets by chemically stitching together platelets of graphitic carbon, which is similar to the graphite found in the soft lead of an ordinary pencil. The fabrication process resulted in a material whose mechanical properties exceed those of carbon fiber composites currently used in commercial products. UT Dallas scientist Dr. Ray Baughman has been ranked one of the decade’s top 100 material scientists in a list compiled by Thomson Reuters. Baughman, who ranked 30th according to the study, is a member of the National Academy of Engineering and The Academy of Medicine, Engineering and Science of Texas; a Fellow of the American Physical Society and the Royal Society of Chemistry; and an academician of the Russian Academy of Natural Sciences. 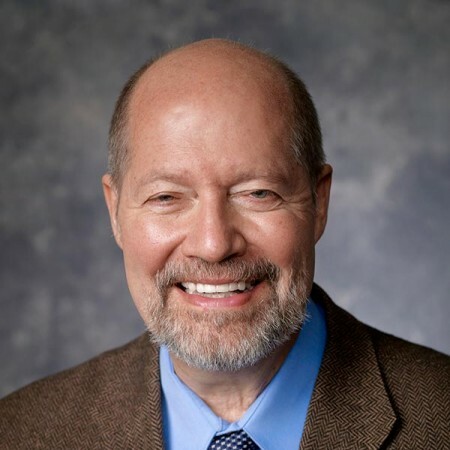 In August 2001, after a career in private industry, he became the Robert A. Welch Distinguished Chair in Chemistry and director of the Alan G. MacDiarmid NanoTech Institute at UT Dallas. Dr. Ray Baughman, one of the most talented and pioneering nanotechnologists of his time, has been recognized by his peers through election to the National Academy of Engineering (NAE). He was one of only two Texans among 65 new members added by the Academy, according to an announcement Friday. 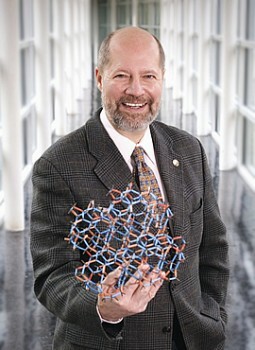 Baughman, the Robert A. Welch Distinguished Chair in Chemistry in the School of Natural Science and Mathematics, and director of the Alan G. MacDiarmid NanoTech Institute at UT Dallas, and was tapped for membership to the NAE for his contributions to the science of nanotechnology, specifically for his work in pioneering novel applications of conjugated polymers and related materials. In a ceremony held recently at Nankai University, in Tianjin City, China, Dr. Ray Baughman received the university’s highest honorary title. The university lauded Baughman’s achievements in the field of nanotechnology, including the development of artificial muscles based on carbon nanotubes, by making him a Yang Shixian Professor. 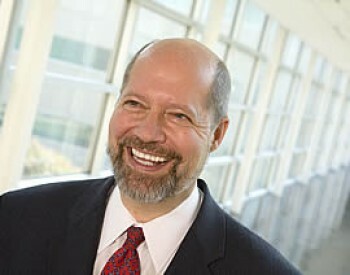 Baughman is a Robert A. Welch Chair in Chemistry and director of the Alan G. MacDiarmid NanoTech Institute at UT Dallas. 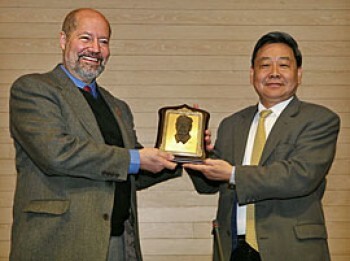 He was recognized for the appointment by Nankai University President Zihe Rao.